FAO Healthy oceans have a central role to play in solving one of the biggest problems of the 21st century – how to feed 9 billion people by 2050. Earlier this year, a study was published suggesting that humpback whales are making a comeback. The population appears to be in the midst of a baby boom, reversing years of decline driven by commercial whaling. It was a rare piece of good news about marine life, and comes at a time when threats to our oceans have never been greater. Every year, World Oceans Day encourages us to celebrate and honour the ocean. The 2018 theme is preventing plastic pollution and encouraging solutions for a healthy ocean. Water covers 71% of the surface of our planet. The ocean absorbs about a quarter of the CO2 that humans emit and marine plants produce most of the oxygen in the atmosphere. However, our way of life is threatening these complex ecosystems. Plastic pollution is choking marine wildlife and harming corals, reaching even the deepest part of the ocean, climate change is causing sea levels and ocean temperatures to rise and acidification, overfishing is drastically depleting the world’s fish stocks and coral reefs are dying. It can seem that the world is awash with bad news about the ocean, but there are also a few bright spots. Here are five stories about marine conservation and cooperation that made waves recently. In the 19th and 20th centuries, the humpback whale was hunted to near extinction. But a new study points to evidence of a rapidly growing population. Between 2010 and 2016, researchers took 577 DNA samples from humpbacks around the Western Antarctic Peninsula. Of those, 239 were from males and 268 from females. The progesterone levels identified in their blubber indicated that, on average over that period, 63.5% of the females were pregnant. In addition, the number of pregnant females was rising, from 36% in 2010 to 86% in 2014. The researchers also found that the whales were reproducing every year; 54.5% of females accompanied by a calf were pregnant. “These high pregnancy rates are consistent with a population recovering from past exploitation,” noted the study. Shark numbers declined rapidly in the 1970s and 1980s as a result of overfishing and bycatch (where fish or marine mammals are caught unintentionally). As Dr David Shiffman, a shark conservation expert and marine biologist, notes in a recent blog, great white sharks were among the first species to benefit from conservation protections around the world. By 2009, the population was back to 30% below historic levels, indicating an upward trend. But numbers of lesser known shark species, including the sandbar, blacktip, tiger, and spinner, are also increasing thanks to conservation efforts. “While we can’t forget that many species of shark are in trouble, we can and should celebrate successes as we work to implement them elsewhere. Shark population increases show that shark conservation works,” writes Shiffman. As we approached the end of the last millennia, North Sea cod stocks were close to collapse. A combination of sustained overfishing along with warming waters reduced the reproductive success of North Sea cod. But in 2015, it came off the Marine Conservation Society’s (MCS) “Fish to Avoid” list. The cod’s recovery was due to an EU plan that included tight quotas on how much fishermen could catch and the number of days they could spend at sea, as well as a large-scale decommissioning of fishing vessels. “It’s fantastic to see this fishery finally off the red list. Years of sacrifice and a lot of hard work have led to population increases above dangerously low levels,” said MCS Fisheries Officer, Samuel Stone. He also warned though, that cod numbers may never return to 1970s and early 1980s levels. Last year saw a huge rise in the number of marine protected areas, with an increase of nearly 4,000 sites covering nearly 7 million km squared. Globally, marine protected areas now cover almost 7% of the ocean, or 2 million km². Notable recent additions include two of the world’s largest protected areas. The Ross Sea Region Marine Protected Area, in Antarctica, at over 2 million km², and the Marae Moana Marine Park in the South Pacific Ocean, at just under 2 million km². The Ross Sea Region Marine Protected Area accounts for 58% of the area protected in the high seas; a very important part of the global ocean which is not currently widely protected. 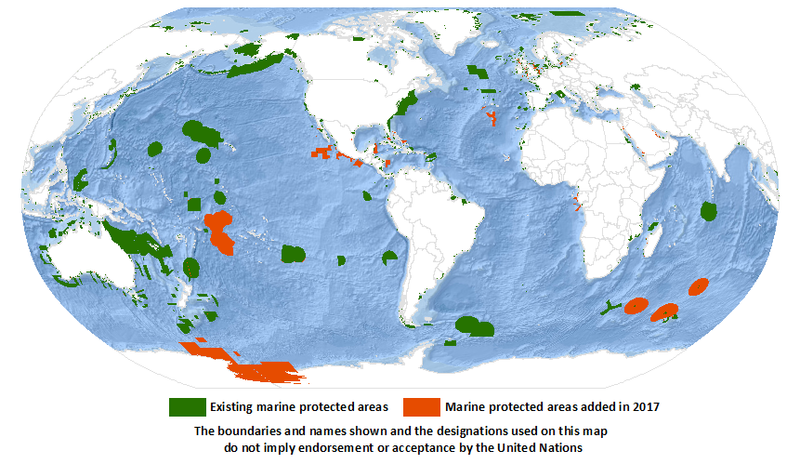 Some countries have also significantly increased their marine protected area network. In 2017, Gabon added 29 marine protected areas, representing a total of 54,340 km². And the UK added six new marine protected areas under the EU Habitats Directive, including several that protect a large portion of Scotland’s northwestern coastline. In September last year, the Pew Charitable Trust put forward a Proposal to Fully Protect the South Sandwich Islands in a bid to conserve this globally significant area of the South Atlantic; in particular, its wildlife. The area has been a marine protected area since 2012, but the trust argues that it will only benefit fully by being made a protected marine sanctuary. The Norwegian fjords are among the world’s most spectacular natural wonders. In order to protect their outstanding beauty, Norway is creating some of the world’s first zero-emission zones at sea. 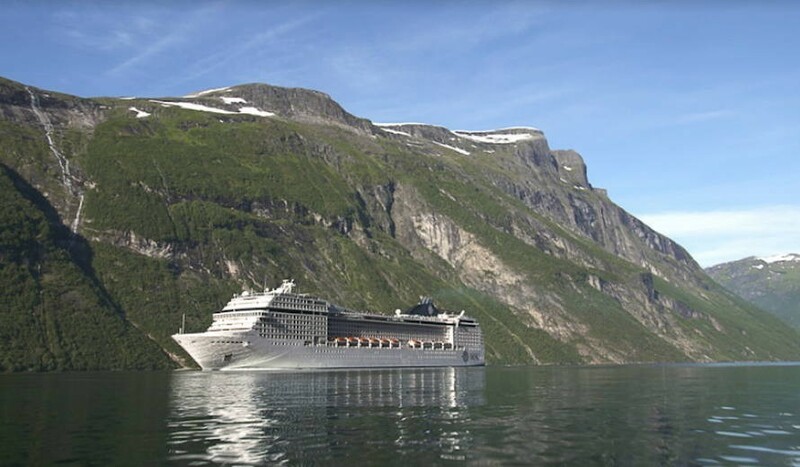 By 2026, only emission-free cruise ships and ferries will be allowed to enter Geirangerfjord and Nærøyfjord, which are UNESCO World Heritage sites. Last year, more than 300,000 cruise ship passengers visited the fjords, which led to increased traffic and air pollution. More than 60 electrical ferries are expected to go seaborne in Norway over the next few years. Countries have been working together to improve the state of our oceans. A reduction in shipping emissions on a global scale was on the agenda at a recent meeting of the United Nations International Maritime Organization (IMO) in London. At the meeting, the UN adopted a climate change strategy for international shipping. Its aim is to reduce total emissions from the industry by at least 50% by 2050. It’s an initial strategy, with the ultimate goal of phasing out emissions entirely. In April, the 53 Commonwealth heads of government agreed to a Blue Charter, geared towards protecting the ocean from climate change, pollution and overfishing. The charter covers one-third of the world’s national coastal waters. Among the countries taking action are Australia, Belize and Mauritius, which are spearheading the protection and restoration of coral reefs; Sri Lanka, which is initiating collaboration on mangrove restoration; Kenya, which is pioneering the development of “blue” economic growth; and New Zealand, which is championing action on ocean acidification caused by man-made C02 emissions. Meanwhile, Canada announced it would use its 2018 presidency of the G7 to tackle climate change, improve the health of the world’s oceans, and transform the way we produce, transport and use energy. Last December, the UN declared 2021-2030 to be the International Decade for Ocean Science, in an effort to “mobilize the scientific community, policy-makers, business and civil society around a programme of joint research and technological innovation”.